Akihito Isaka 8th Dan J.K.A. Interview By Bob Sidoli. Training Past Forty. By John Cheetham. International Shotokan Reports from New York and France. The Development of Shotokan. By Harry Cook. Makiwara Construction. By Timothy Hanlon MD. 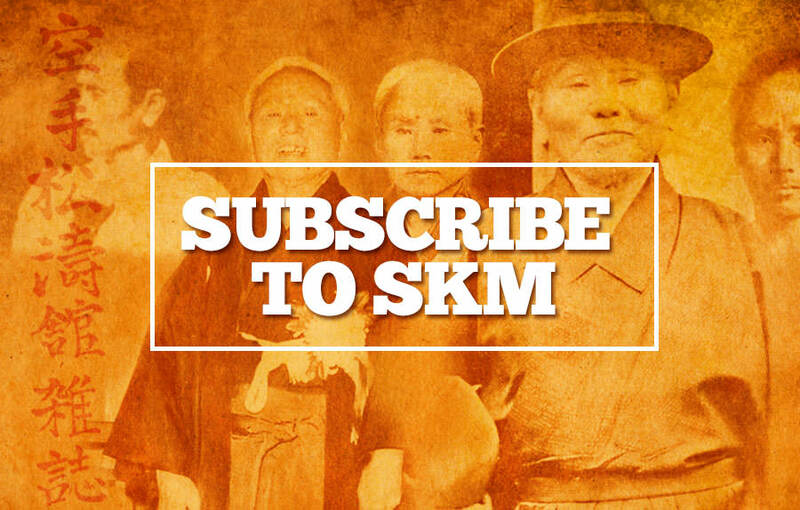 The karateka on the front cover of this issue of SKM really does qualify for an often over-used title, a 'Legend' and that is the opinion of every Shotokan karateka who has been around for a while! 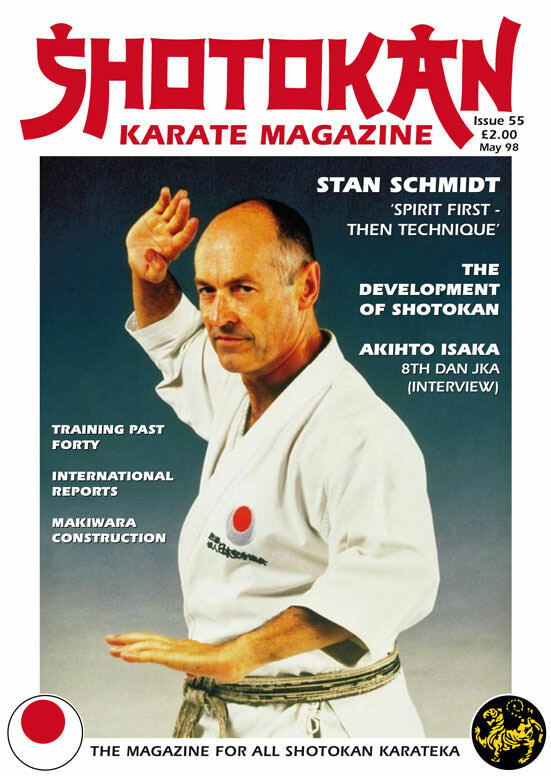 Stan Schmidt 7th Dan JKA is a 'legend' in Shotokan karate, no question about it, and I am more than pleased that we have an exclusive interview with sensei Stan in this edition. An absolute 'cracker' it is too. The interview was conducted in Stan's home country of South Africa, by Seamus O'Dowd, a karateka from Dublin, Ireland, who was recently over there visiting and training with sensei Stan. Stan Schmidt has lived the karate life for almost forty years of total dedication to the art and is highly respected around the world. 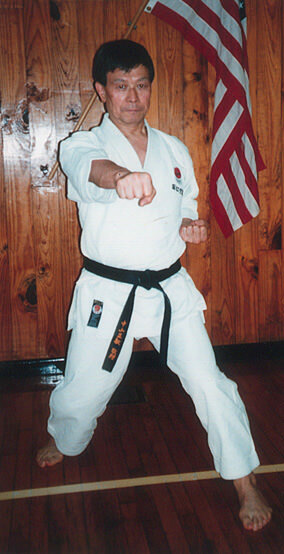 He is a member of the Japan Karate Association - Shihan kai (Sugiura faction). Harry Cook is an authority on the history of the martial arts (karate in particular). He paints a very interesting picture of the development of Shotokan from when Gichin Funakoshi first arrived in Japan in 1922. Harry also proves without doubt, with some very clever and detailed detective work, that the old movie film of Master Funakoshi performing the three Tekki kata and Meikyo / Rohai kata, which surfaced recently, could not possibly have been from as early as first imagined, (1924) as stated on the video cover of the film. This article will be of great interest to students who study thehistory of Shotokan karate and want more information and facts on this subject. We have a great interview with a JKA instructor from the (Asai faction) - Akihito Isaka sensei 8th Dan. I feel this is quite an unusual interview from a Japanese instructor, his views and ideas of competition for example are thought provoking and he is still competing in his mid-fifties which is highly unusual even for western karateka, let alone a senior Japanese J.K.A. Instructor. Many readers feel, and have written in to express, that it has to be said in all honesty and fairness, that some of the interviews we read from the Japanese sensei's are rather sparse and many readers feel that at times they don't give enough information. This may be the case. However, we must remember of course, that many times, this is the Japanese 'way', as can be seen by reading Mike Clarke's article and his description of the traditional 'way' of teaching the martial arts. I do feel that very often we (Shotokan) karateka are mis-understood by many other practitioners of the martial arts. As if we don't have an open mind to other arts. I find this is in fact far, far from the truth. And most times the absolute reverse. But what people seem to be doing now is looking deeper into the Shotokan system and finding the links with other systems. Finally, and without doubt, very importantly, I advise, no I urge you all whether you are 8th Dan or 8th kyu, to read Ged Moran's article, 'The Ultimate Aim', in the 'International Shotokan Reports'. We should all feel humbled and moved after reading this and count our blessings. When you think of the times we (able-bodied) karateka complain about relatively minor injuries, aches and pains or not feeling on form etc!!?? Good training, good thinking! Editor. Training Past Forty By John Cheetham. Okazaki sensei, going strong at 67 years old. Traditional karate and the martial arts in general, are without doubt one of the very few dynamic, physically demanding activities that people still practice into old age. There are literally hundreds and hundreds, maybe thousands of karateka over the age of sixty, training in the art the world over. I very much doubt that the same amount of people still do gymnastics or football at the same age. Some of Shotokan's most senior instructors, Nishiyama, Sugiura, Kase and Okazaki for instance are all close to seventy years of age and still showing amazing physical ability. Many people argue that such people are physiological 'one-offs'. This may be the case, in terms of their skill and technique within this particular physical art. However, many believe that it's very possible for lesser mortals (in terms of actual ability) to match them in fitness, strength and flexibility if they train correctly after the age of around forty and on into their sixties. A karateka who started training at around the age of twenty, has every chance of maintaining their speed, strength and flexibility once past the forty mark. Those three key areas 'can' be maintained by virtually everyone (injuries permitting). However, the key word is 'maintained'. It's doubtful that karateka will get faster, stronger and more flexible with age and most certainly recovery time after training will slow down. But, maintaining what they have built up over the years is certainly very possible and should be a priority, in one's own interest. Areas which 'can' improve however, are in technique, skill and very often timing and distance awareness. These attributes can most definitely improve with age, no doubt about that! One of the most regular requests we get from letter writers is about this very subject; How should I train now I'm past forty? I've talked to many senior karate instructors, and physiotherapists, chiropractors, osteopaths, sports coaches, etc., and they all have 'different' answers. But one point they all agree on is that there is no physical reason why a person should 'ease-up' once past the age of around forty unless they have chronic injury problems. And nowadays such people (physio's etc) advocate training (with care) through injuries rather than total rest and abstinence from the activity, which is very interesting. It makes good sense because the older you get and the stiffer you become. You have to keep moving. We will all spend a very long time being stiff, that's if you're buried and not cremated! On a lighter note, let's get back to the training angle. Of course everyone is different and some people have quicker recovery time and a stronger constitution than others within the forty-plus age bracket, the so called 'vets' of karate. Stan Schmidt made a great statement in his interview when he said, "There's a time for hard training and a time for soft training but always a time for training." That sums it up perfectly. Once past the forty mark, this concept is the 'key' to maintaining what you have, in a physical sense, and also for mental stability. If you go to the dojo on say, Monday - Wednesday and possibly Friday (three times a week) or Tuesday - Thursday and Sunday or even twice a week, with rest days in between, then this is probably ideal for the majority of people within this age group and if they are training correctly they should 'maintain' what they have for a very long time. Lay-offs at this age are not a good idea because it is very hard to 'get-back' to where you were. Really serious trainers would obviously do other training in between the dojo sessions. This is what will make the difference! To flog yourself with endless hard sessions will (for the majority) end up in 'burn-out' or probably injury. So how should someone in this age range work out their own training regime? The following ideas and concepts are based on conversations with experts in the aforementioned groups. So this is a 'general' guide aimed at the majority. Obviously it may be 'too much' for some people and 'not enough' for others - so it's across the board in general terms. Ideally, three good (one and a half hour) karate training sessions per week with a rest day in between would suit and do the most good for serious karateka in the forty plus age bracket. What people do on the other days (in training terms) is also an interesting part. Generally a typical karate session is quite hard, not easy and most physio's say that a 'hard' training session should be followed by light training and lots of stretching which sounds sensible and reasonable. If you are twenty years old, you could do hard sessions every day and recover, no problem! At forty plus it could possibly be counter-productive and energy levels would drop for sure. So how best to maintain one's body? Lighter training can cover a wide variety of physical work. Many karateka like to go to the gym on non-karate days and maybe do weights and exercises. Some prefer running or maybe a good stretch and a couple of sets of press-ups, sit-ups, chins etc. Others may prefer total rest on non-karate days whilst others may practice their kata and basics. You have to listen to your own body and train intelligently and sometimes do what the mood dictates to maintain the 'enjoyment' factor. Of course work and family commitments play a vital role in how much time you have. You have to be your own 'personal trainer' outside the dojo and work out what's best for you as an individual. Hours of repetition punching and kicking is definitely 'not' recommended for older students. Bag-work or makiwara (a flexible makiwara with lots of give) however, is highly recommended especially on non-karate days, as is stretching and loosening up in general. An interesting point made by a chiropractor friend of mine was that we (karateka) should try to develop a 'lighter' feel to our movements even at speed; meaning not stamping around everywhere with heavy floor impact, which puts strain on the knee joints, hips and lower back. For instance, don't stamp with oie zuki or when landing after a jump in kata, land lightly - not like a baby elephant! One point which does appear to be debatable, (with karateka) is whether it's really necessary to do 'heavy' kime all the time when punching/striking or kicking in fresh air? Or to vary the degree of kime depending on energy levels or other reasons. One Osteopath I know in Spain, (a 4th Dan in Shotokan) told me that he feels that too much 'kime' is both dangerous to the joints and slows most people down! He teaches his students very light kime and emphasises 'speed' of technique and movement instead. However, he advises at least one or possibly two 'heavy' sessions a week on either a bag or makiwara but lighter 'kime' when punching fresh air. The other end of the spectrum has karate instructors yelling for 'more kime' - 'more kime'! When observing the older karate masters one sees the same principle unfold. That is, they all have a very soft, light, fluid body movement - in getting from A to B - then a fast, dynamic blast of kime at the end of the movement / technique. The problem most older students (and younger for that matter) have, is developing this softness and fluidity of actual movement. Usually there is far too much 'tension' and strain involved which is both unnecessary and slows you down. However, the hardest thing of all for most older karateka (regardless of grade) is how to learn to relax at the right moment. Many older karateka can't train 'light'. They are so used to kime and muscular contraction all the time, that as soon as they try to be lighter and more relaxed they confuse this with being 'sloppy' and their technique goes to pieces! Skill 'can' improve with age and this ties in directly with learning to relax more and also learning to conserve energy. All the athletics coaches say this. It's not just karate. One simple idea, used by many instructors, would be when blocking and countering in kumite. It doesn't matter if it's basic gohon kumite (five step) or ippon, jiyu ippon or free style sparring, the principle and idea is the same. e.g. When the attacker is about to launch their attack against you, 'don't' tense-up, try to develop a relaxed awareness, then respond fast but 'inhale' on your block and movement (evasion) saving all your energy for the counter with kime and exhalation. What usually happens however, is the absolute opposite! People 'tense-up' before and during the attack, exhale heavily on the evasive movement and block, and have virtually no energy left for the counter, where it's needed the most - to stop the attacker. We have all seen this scenario night after night in the dojo. So, older students especially, should work and study on this simple principle (in theory) but very hard to put into practice because of the stressful nature of kumite - combat. Stress and body tension work hand in hand as we all know. Without doubt the biggest single problem with most older karateka is - too much tension. If you are an instructor yourself you will know - you go to move someone's arm to a different position and it's like trying to move a solid iron object. You invariably laugh and say, "Relax, I can't move your arm to put you right," or words to that effect. Many instructors we have read about in SKM, for instance, Kenneth Funakoshi, Sumi, Kanazawa and Isaka in his interview in this issue, stress the importance of occasionally doing the following type of practice e.g. Relaxed body control practice of techniques with no tension or kime. But so many karateka (especially older one's) just can't do this. They seem to want to do (not purposely) kime and body tension virtually all the time. They can't help it. So maybe one way of learning how to relax is to practice with this method; i.e. Practice techniques very slowly with no tension (like Tai Chi) then build up the speed until you can become 'fast and relaxed' with good technique (not getting sloppy) and finally be able to add the kime and muscular contraction right at the end of the technique for one split second of time. However, as Leon Montoya said in the last issue, people find it very difficult to re-learn a different way. We must develop this idea of having a 'beginner's mind' in karate. An important point also with older students, is maintaining motivation. Enoeda sensei said in his interview (issue 51)...."Of course as you get older your body changes and so does the emphasis. When you are younger there is more emphasis on the physical aspect. When you get older there is more emphasis on 'mind'. This could be explained like this. When you are younger it is easier to go to the dojo and train for a couple of hours. As you get older this desire becomes less, and you also have more commitments. So you have to use your mind and 'push' yourself into going to the dojo." Wise, yet very realistic words from Enoeda sensei. I asked a boxing coach (amateur boxing) how they thought a 'forty plus' boxer should train for a high level of fitness and ability and for general body maintenance, (but of course not to fight in the ring). The answer I got was in the form of a weekly regime: He suggested: Monday night - very hard training session. Tuesday rest. Wednesday light to medium session. Thursday light to medium session. Friday - hard session. I asked a 52 year old sprinter friend of mine, (who still competes) about his training regime, but I don't think I'll tell you, it's frightening! Hard, very hard! Murderous circuit training and gruelling interval sprints, plus hill sprint training etc, about three or four times a week. They (sprinters and track athletes generally) are masochists for sure! In conclusion, it seems that there does not have to be any radical changes in a karateka's training after forty. What does make sense is that rest and proper recovery time is very important with more 'stretching' being a very positive idea. It's quality training that's important not quantity and maybe not quite so many hard sessions as a younger person. The rest is simply, listen to your own body. However, as Enoeda sensei suggested, your body might not want to be bothered going training even though your mind and spirit really do want to! What shall we do? Get up and go training man! You know that you always feel better after, both mentally and physically, and it's a great excuse for that very welcomed 'cold beer' after training!